Looking for healthy Asian recipes? As I have said many times, almost every recipe can be modified to a healthier version and here are 2 that I love! They have been changed to be good for you AND yummy! 1 whole garlic clove minced. Combine all of the above and mix well. Heat oil in pan and sauté chicken until done. Add prepared vegetables and lightly stir fry for a couple of minutes or until warm. Combine chicken mixture with cooked noodles. Drizzle sauce over and toss to cover. You can enjoy chilled or warm. 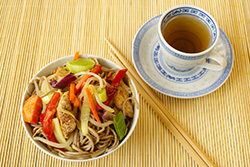 It’s your choice but either way enjoy this first one of two healthy Asian recipes! Heat skillet to med high and add steak to oil. Cook for about 1 ½ minutes on each side and then add yellow and red peppers. Stir and cook for another 2 minutes while stirring. Remove from skillet. cook brown rice according to package directions and set aside when done. Add to skillet. Heat to boiling. Cook another minute or two. Add steak mixture back in and stir to coat. If you want the sesame seeds, you may sprinkle on top at this time. My children don’t care for them so I leave them out of most healthy Asian recipes that I cook. Easy Asian recipes are fun to cook. I think because most of the meal is prepared in one skillet or wok. Less to clean is always appealing! Get creative and experiment. 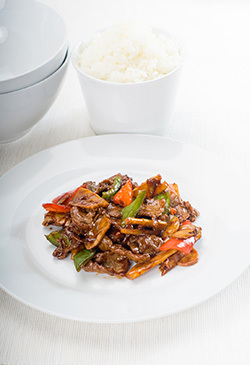 Add chicken, shrimp or a lean cut of beef to some of your favorite veggies and stir fry in low sodium soy sauce. This makes for a super quick meal to add to your tasty Asian recipes tab and fits into your Healthy Asian Recipes eating plan. I used to think of Asian eating as meals that are high in sodium. And lots are but there are many that are not especially if you prepare them yourself and use low sodium soy sauce instead. Asian cuisine is actually very healthy. This is mainly because many dishes use lots of veggies, beans and fish. Speaking of Healthy Asian Recipes…and while you are experimenting with new things..Have you ever tried sushi? I am honestly addicted to it now. At the age of 43, I have gotten past the “raw fish” element when, honestly, I realized the health benefits associated with this high protein dish. Now, I could eat it 2 – 3 times a week. I love it! For more Asian dinner recipes like Chicken Chinese Fried Rice click one of the links below and remember I would love to hear about one of your Healthy Asian Recipes or have you review one of mine.